A gathering of musician educators who are working with young people and interested in sharing and developing their skills. 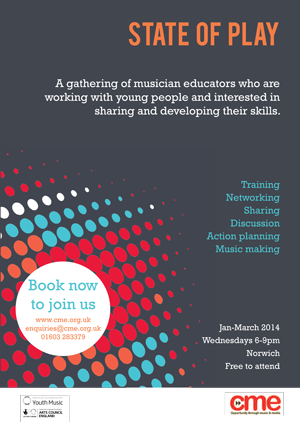 CME invites musician educators who work with young people to a series of free training/networking/sharing events taking place on Wednesdays 6-9pm at The Birdcage in Norwich from January to March 2014. Participants can attend all 6 events, or drop into the ones most relevant to their interests/needs. Each of these informal and focused sessions will be a blend of discussion, guest presentations and practical activity on a particular theme, followed by action planning. Music will be at the heart of activity and there will usually be some form of live performance – an opportunity for a young band showcase, an experiment or other activity related to the main theme. The last hour of the event will be an opportunity to network and socialise. 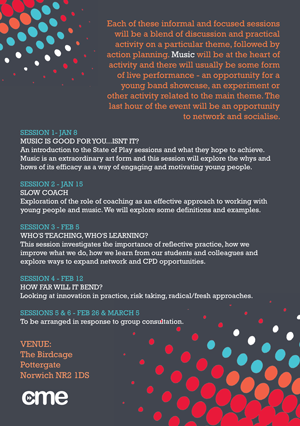 Sessions will be hosted by CME and chaired by MARK HOWE, Freelance Community Music Practitioner, who has worked with CME for many years, specialising in band skills, engagement, tutor training and junk instrumentation. It is hoped that this series of sessions will inform the wider dialogue about community and voluntary sector arts based practice (this is what goes on here and why)! Sessions are free, but please book your place in advance at http://www.cme.org.uk/booking-form/ (select State of Play). Once we have your details we will contact you to find out which sessions you wish to attend. These sessions are funded by the National Foundation for Youth Music. This entry was posted in Uncategorized and tagged culture in norwich, music education, music educators, music in norwich, networks in norwich, norwich, youth music. Bookmark the permalink.